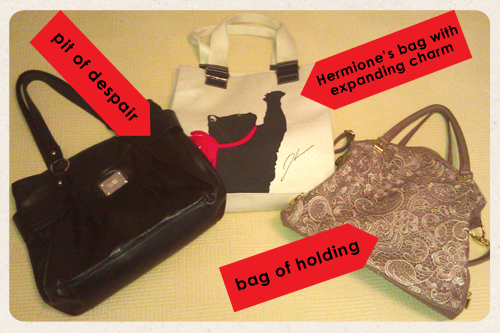 It's amazing to me how I manage to lose things in my purse. Right before I leave to go anywhere, I'll do a check to make sure I have my keys, my phone, and my wallet. You'd think this would take, what, thirty seconds? But because I can never find anything in my bag, it's a whole process where I have to take everything out, find the thing I was looking for, and put everything back again. It's like my bags have curses on them. Likewise, you'd be amazed at how easy it is to lose something in a small apartment. Sure, you don't have as much ground to cover in your search, but somehow, some way, the thing you're looking for has gotten up and walked away. There's a little song I like to sing to myself when I'm searching for my goddamn car keys AGAIN. I swear to you, it helps. But if the magic powers of Billy Corgan (as channeled through Stephen Lynch) can't help you find your keys, howsabout you just train yourself to put them down in the same place the moment you walk in the door? Organization and a little bit of discipline are essential when living in a tiny home. Plus there's the added bonus of establishing an entryway to your home. Even the smallest apartments need to have a space by the door where you can put on your game face before walking out into the world. This beaut from Anthropologie has elegant charm while being very, very obvious what it's meant to be! 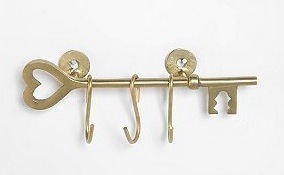 Urban Outfitters has this whimsical keyholder. 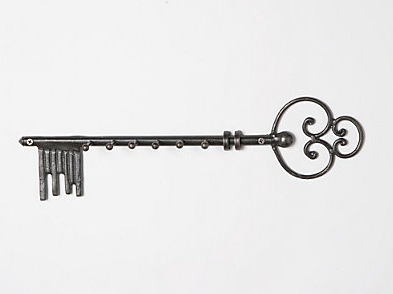 Like the one above, its key shape broadcasts its purpose, while the heart shape sweetens its look. Now we're gettin' geeky! I thought this ethernet jack rack was hilarious. You attach the connector of an ethernet cord to your keychain, and when you get home, you click your keys into place, just like you would hook your computer up to the internet at home. (If you don't use wireless, obviously.) 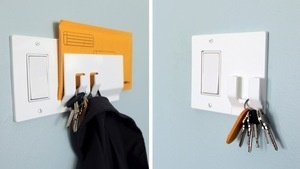 From Instructables via Lifehacker. It's no magic trick -- it's an illusion, Michael! 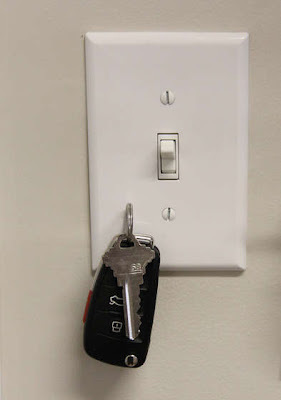 Hidden behind the switchplate is a magnet that sticks to your keyring, keeping your keys suspended in mid-air, right next to the light you turn off before walking out the door. 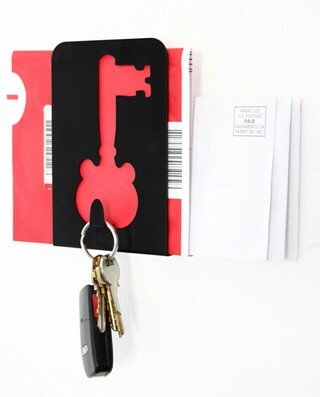 From Instructables via Lifehacker. This cute cutout rack also holds your mail, so you can remember to drop that Netflix disk in the mailbox. From Fold Bedding (currently out of stock). 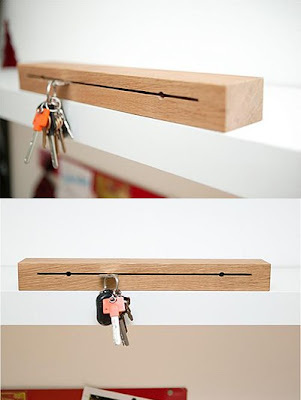 This wooden key holder is wonderfully clever as it is minimalist. 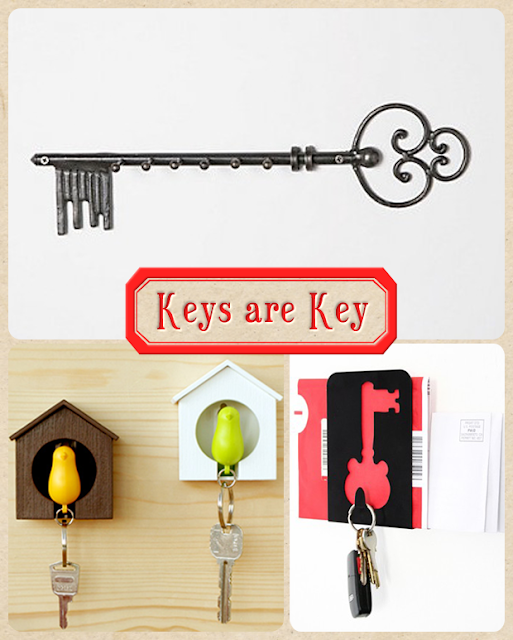 All you need to do is insert one of your keys into the carved slot; the block keeps it snugly balanced and keeps it from falling out. From Bauldoff. 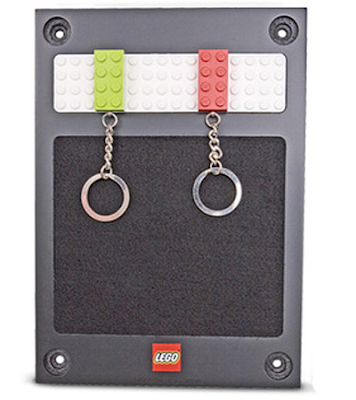 I have a Star Wars stormtrooper minifig on my own keychain, but this is much more useful! If you love Legos, you'll never forget to put your keys in their place when you return home. From Curbly. These sweet birdies are easily the cutest of the bunch. 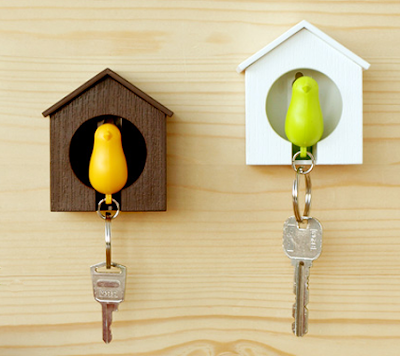 When you get back to your nest, put your bird keychain into his lil' house to keep your keys safe. There's also a set with two birds, for you cohabiting couples. Available at Utility Design and Rakuten (in Japanese). 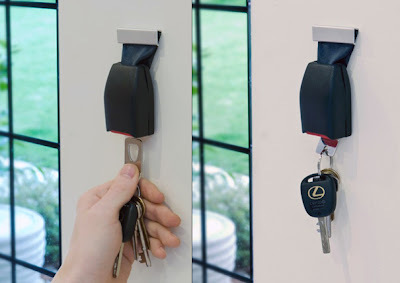 If you're the type who turns up their nose at Top Gear: America and proclaims that only the British version will do (even if they do drive on the wrong side of the road), give your car keys a showcase befitting a car buff. Buckle up and keep your keys from making a wrong turn. From Yanko Design. 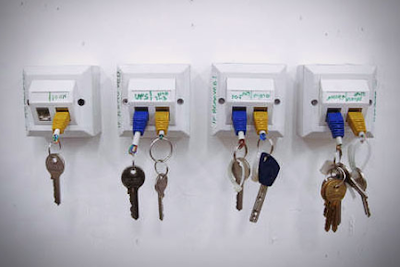 Omg, the ethernet key holder is AH-mazing. I want one, stat. My boyfriend is always losing his keys (hat, shoes,) so I think having a sense of humor about it would help.